It's all about smartphones in today's roundup of the best tech news, courtesy of our friends at TechRadar – we've got details on upcoming handsets from the likes of Samsung and Huawei, a new 5G-capable phone from Motorola, and some news on Android P too. The Samsung Note 9 leaks continue to roll in and the latest is a video that seems to have come directly from Samsung itself before it was pulled from the web. It shows the new phone will be available with 512GB and the option to extend it with a 512GB memory card, giving you a whopping 1TB of storage in total – surely more than enough for a phone. We're also expecting to see a wireless charging pad that supports two devices at once when the Galaxy Note 9 is unveiled on the 9th of August. It seems that Amazon may have prematurely put this device, the Samsung Wireless Charger Duo, on show at a press event – all but confirming that the hardware is real and is likely to be unveiled in the near future. Google has told us a lot about Android P, but we don't yet know when it's going to get pushed out to the world – with Nexus and Pixel devices likely to be first in line. A new report from trusted leaker Evan Blass says the final version of the mobile OS is going to start rolling out from the 20th of August, so mark your calendars if you're on Android. 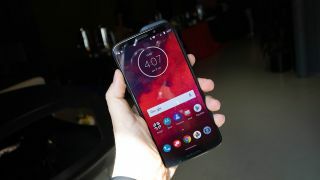 Motorola just took the wrappers off its new Moto Z3 smartphone, and apparently later in the year it's going to get a Moto Mod that will upgrade it to 5G – making it one of the first 5G-capable phones on the market. As well as higher speeds, 5G should also provide lower latency and expanded bandwidth... as long as you live in a 5G-enabled area, of course. What's next in store for Huawei? Huawei is preparing to launch the Mate 20 and Mate 20 Lite phones in the near future, and a picture of the latter just found its way onto the web. It doesn't actually show us much, but it would appear to confirm such a phone is on the way – the thinking is that it'll have a screen stretching above 6 inches in size, and possibly arrive officially sometime in October.